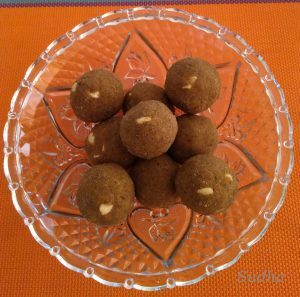 These are very healthy and tasty Laadoos made from whole Moong (Green Gram) flour. I’ve added Khaskhas (poppy seeds) to make it more delicious. But you can skip it if you don’t like it. 1. Dry roast Khaskhas till light brown. Leave it to cool. Grind into a coarse powder. Use grinder in pulse mode for a few seconds. Else the powder will become oily. 2. Roast Moong flour with pure ghee, on medium flame, till light brown. There will be nice aroma of roasted flour. 4. 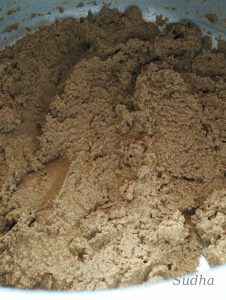 Add the jaggery to roasted flour and mix well. 5. After 5 minutes add powdered sugar and mix well. 6. Add chopped cashew nuts and cardamom (Eliachy) powder. Mix well. 7. Let it cool till mixture becomes warm. Keep stirring in regularly. 8. 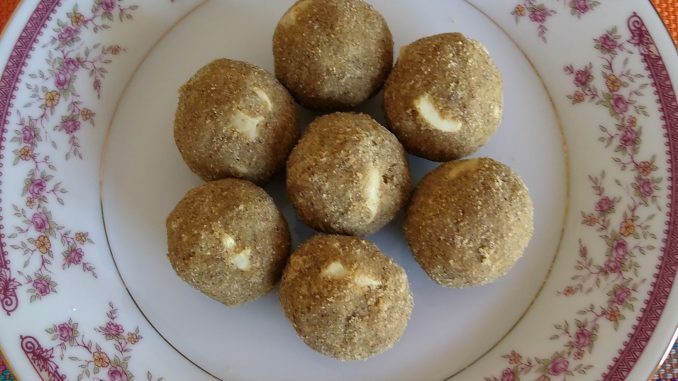 Make lemon size laadoos. If the mixture is too dry and difficult to roll laadoos, add a spoonful of ghee and heat the mixture for a couple of minutes. Then roll laadoos. 1. 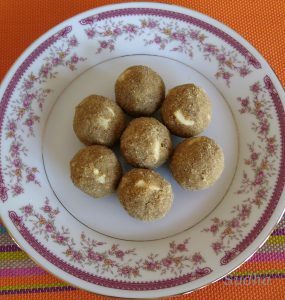 Whole Moong flour is used in this recipe. 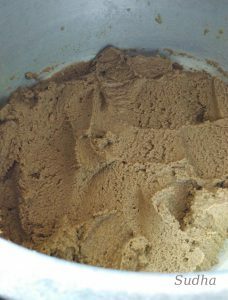 Not Moongdal (Split Green Gram) flour. You can make laadoos of Moongdal flour also like Besan laadoo. But Laadoos made with whole Moong flour are more delicious. 2. If you don’t get Moong flour in the market, get Chhilakewai Moong Dal (Split Green Gram with husk). Dry roast it till light brown and you get nice aroma of roasted gram. After cooling grind it in grinder into fine powder. If you like honey, add ¼ cup of honey in step 5 and mix it. Since honey is sweet and moist, reduce powdered sugar to ½ cup and reduce ghee to ½ cup. 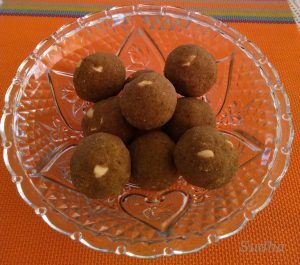 If the mixture is dry and you are not able to roll laddus, add a spoonful of ghee and mix. You will be able to roll laddus. With honey the taste of laddus enhances. Try this.